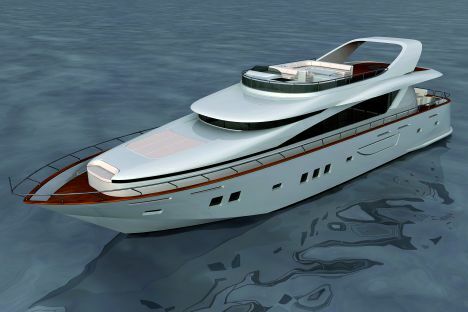 The Seanest 25 metre motor yacht is the result produced by a team of the sector's experts. Under the supervision of Seanest's technical office the project was developed by Sterling Design for the interiors, A-Lab for the exteriors and Fast Engineering for the engineering systems. The MY 25 has a planing hull and two decks plus a sun deck. The sleeping quarters are all spread over the lower deck with the owner's master cabin together with a "Vip" cabin with respective bathrooms at the bows, whereas, at the centre of the boat there are two guest cabins each with an en suite bathroom. The latter two, may alternatively be substituted by one double cabin with an en suite bathroom. The crew's quarters are at the furthest point forward with one or two bunk beds and a bathroom. The convivial areas on the main deck, moving from bows to stern, consist of a wheel house, a small saloon for the crew, a galley portioned off by a glass panel, a dining area and a saloon with an "L" shaped sofa with a maximum seating capacity of eight.. On the sun deck there is a second wheel house, a saloon with a table, a bar cabinet or barbecue and a platform for positioning a tender. This too may be substituted on request and turned into a large sunbathing area. Displacement fully laden: 65,000 Kilos. Declared cruising speed: 25 knots.